The highlight of this year's Akkar Summer School of Spiritual Solidarity was a great summer camp organised with local volunteers from different communities. We brought together Syrian and Lebanese children from Muslim and Christian villages to learn, play and sing together on top of the Akkar mountains. From 28 August till 22 September 2017, participants from around the world came to the R&R Peace Centre for our first "Akkar Summer School of Spiritual Solidarity". International participants from various academic backgrounds joined forces with local volunteers from Syria and Lebanon to reflect upon this guiding principle of our work. Academic courses on political, religious, legal and humanitarian aspects of the Syrian refugee crisis were combined with outreach activities and the implementation of small solidarity projects in the different communities we serve. R&R Syria volunteers and friends from Lebanon and abroad joined in the second annual Solidarity Olive Harvest in Akkar, 11-13 November. The purpose of the yearly event is to help the Syrian families who have found shelter and work in the olive orchards and support our peacebuilding efforts while giving guests a chance to enjoy the hospitality of our volunteers and the natural beauty of the area. The R&R Peace Center, now in its fourth year, is an open house for local Syrian and Lebanese children and families. It serves as a site for classes and recreation and as a home to our international volunteers. The center is in Bqarzla, a small Maronite Christian village in a religiously mixed area, surrounded by olive orchards where many of the refugees we serve work long and hard every day. This holiday season, as you spend time with friends and family and shop for gifts for your loved ones, please take a minute to watch our Christmas message and to think of us and of those we serve. Take off the mask of prejudice! Please watch and share this powerful film produced by the refugee youth at R&R Syria's youth press club in Akkar (Lebanon) with the help of students from the audio-visual department of Université Saint-Joseph in Beirut. "Take off the mask of prejudice and see the human face of the Syrian youth!" This is the message the youth in the refugee camps at the Syrian border want to convey to the world. The youngsters decided themselves what labels they see imposed on them. Many thanks to them and to the Lebanese students who came during two long weekends to Akkar for producing the footage and putting together this fantastic film! 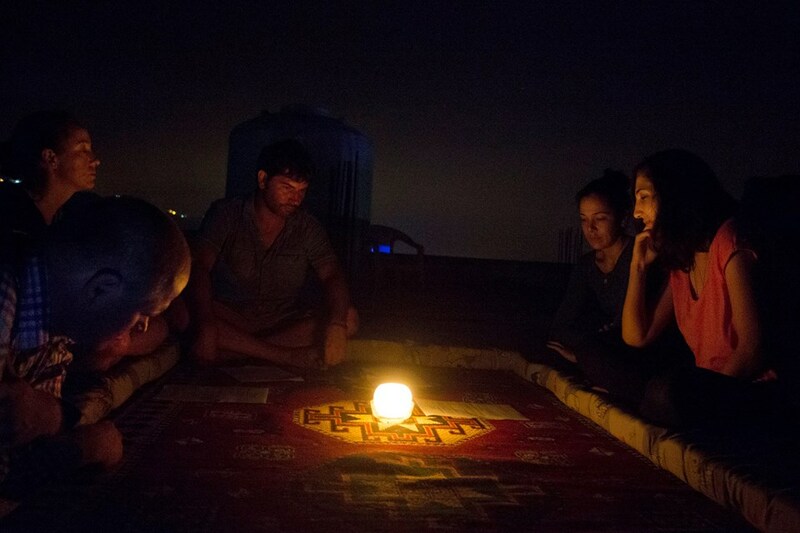 During the 9 days leading to the second anniversary of Father Paolo Dall Oglio's disappearance in Syria, on 29 July 2013, our international volunteers gathered every night on the rooftop of the R&R Peace Centre in Bkarzla for a moment of silence and meditation. Muslims, Christians and persons of other beliefs were united in their prayers and thoughts for Paolo and all other victims of dictatorship, war and hatred. In a form of novena, we were reading and discussing words from Paolo as well as other texts out of the Jewish, Christian or Muslim tradition. During the Easter holiday, on Tuesday 7 April, several dozen Lebanese and Syrians, Christians and Muslims united, were marching together for peace and justice in Syria. In a time where hatred and violence are dominating the international news, they wanted to set a symbol for solidarity between different religions and convictions. Buses were leaving in the early morning from Beirut and from Akkar to meet in the breathtaking nature of Qadisha Valley, the Holy Valley of the Maronites where more than a dozen of old monasteries, carved in the steep rocks, are witnessing the long and rich history of faith since the Maronites themselves arrived as refugees, several hundred years ago, fleeing persecution to the safe mountain retreat. On 12 October, our non-formal camp school in Akkar (Northern Lebanon) started its second school year. 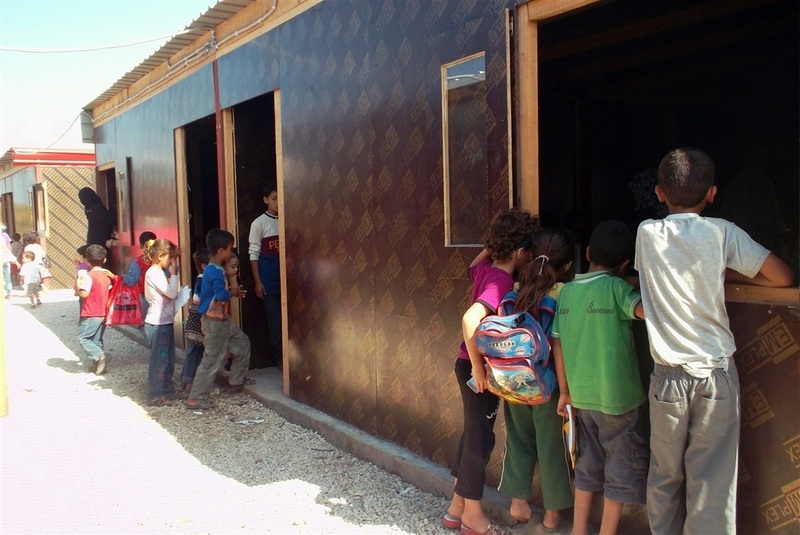 We have been running this non-formal school for Syrian refugee children throughout the school year 2013/14. And now we have big news to announce. 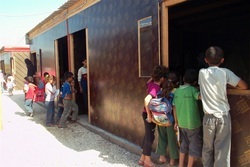 During this summer, the Lebanese charity initiative Malaak provided the funding for building 14 new class rooms. During summer, we started to enroll 200 more kids from surrounding camps who had been out of school for more than 3 years. The extended camp school is now giving daily lessons to more than 300 students.. This summer 2014 saw the second edition of our special Ramadan Volunteers Programme. 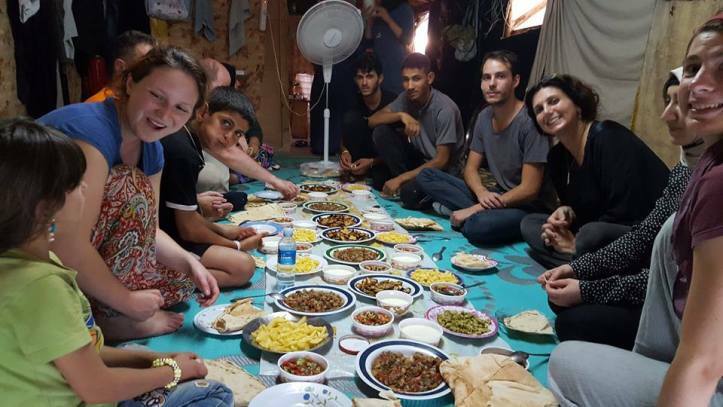 From the beginning of July till the end of September, 21 international volunteers stayed at our Peace Centre in Bkarzla (North Lebanon) in solidarity with Syrian refugees and Lebanese in need. We united people from around the world and from all confessions around this common cause and we worked hard to bring more Syrians back into school. By now, we could increase the total reach of our educational activities to more than 700 students. A great thank-you to all our volunteers and staff members for this tremendous job! And a thank-you also to our donors from around the world who made it possible. 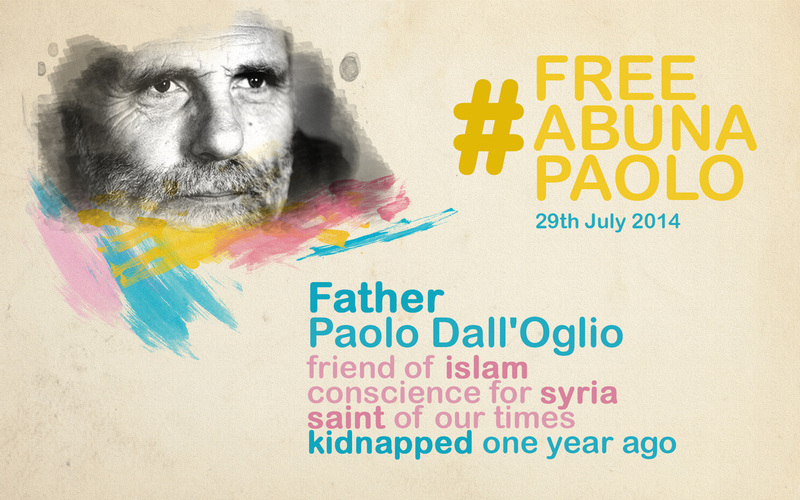 One year ago, on 29 July 2013, our dear friend and mentor Father Paolo Dall'Oglio SJ disappeared in Raqqa, Syria. He went on his own and with his free will to the capital of the freshly proclaimed "Islamic State in Iraq and Syria" for negotiating the release of hostages taken by this extremist group and for building peace. We phoned right before his arrival and talked about the danger. He was perfectly aware of it, but he had to go. Having dedicated his life to Syria and to the love of Islam, he could not turn his back to this darkest hour in Syria's modern history. We have no news since he entered the base of the ISIS fighters. Many rumours are circulating, but there is no formal proof either for his survival nor for this death. We all hope he is still alive and we join the call of his family upon his kidnappers to give answers. One year after the establishment of our first Peace Centre in the North of Lebanon, we are entering again the Holy Month of Ramadan: a special time for the about 1.6 billion Muslims in the world and a special time for the millions of Syrians who had to flee their homes. For us, it is also the time to bring together different religions and beliefs in a genuine expression of spiritual solidarity. We started the second edition of our special programme "Ramadan Volunteers", which is bringing short-term volunteers from around the world to our Peace Centre. Throughout the summer, they are helping us in our response to the educational emergency of Syrian refugees in Lebanon. They are giving international solidarity a human face. If you live in New York or if you have friends there, please spread the word about the exhibition of artworks from the children of our Syrian refugee camp school in the North of Lebanon that is going to open on 20 March 2014 at 6 PM at Rogue Space Chelsea, midst in Manhattan. We reported already about the amazing work Kevin from New York and Jerar from Syria did for introducing our kids to new art techniques. Now you can admire the results and buy one of their art works. The benefits of this auction will go 100% back to the camp school. In the comping days, you will also be able to purchase one of the art works online. Besides our daily school classes for Syrian refugee and Lebanese host communities, we started to develop vocational training modules for giving also an economic perspective to those who need to earn their living. Refugees do not want to rely on charity alone, they want to take back control of their lives and work. Since December 2013, a group of women from the refugee camp of Minyara, close to our Peace Centre, are gathering five times a week to attend sewing and jewelry workshops taught by experienced teachers we hired. The impact is already visible: the sewing group made first deliveries of school uniforms and the women of the jewelry class opened a small shop for accessories. You can also purchase these items through our national chapters in Europe, empowering hence the women and supporting refugees to help themselves. Please do not hesitate to contact us if you are interested in a delivery. 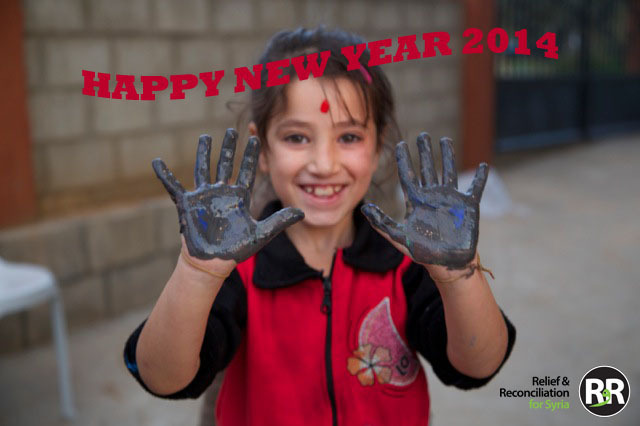 ... and happy 2014, year of hope! 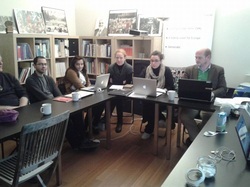 One year ago, on 2 January 2013, we established our new NGO “Relief & Reconciliation for Syria”. It has been a year of struggle, a year of grief and probation. But thanks to your support, it has also been a year of grace. Today, it is time to say thank you and to look ahead. The situation in Syria is getting worse every day. According to the UN, more than two-thirds of Syria’s population has been displaced. Lebanon alone is hosting between 1 and 2 million refugees- about a third of its own population. The stories we have heard and seen in our work in the field remind me of the worst memories of our history in Germany and Europe. Our fears to see the Syrian Revolution being pushed into sectarian war are turning into reality. The Syrian regime and other actors have chosen this path in cold blood to maintain their grasp on power. But there is hope. We are amazed by the deep sense of humanity we encounter in every conversation with Syrian refugees. In July 2013, we started our operations in the North of Lebanon with the opening of our first Peace Centre for the youth in need. We united all major communities of the region around this common cause. At the big Peace Iftar we organised in Ramadan, Christians and Muslims of the region were united in their solidarity with Syrian refugees. Sunnis and Alawites, who are on the opposite sides of the conflict, were praying together for the first time here. Until the end of the year, 20 international volunteers stayed at our Peace Centre and joined our local staff in the teaching of languages and the development of the arts. 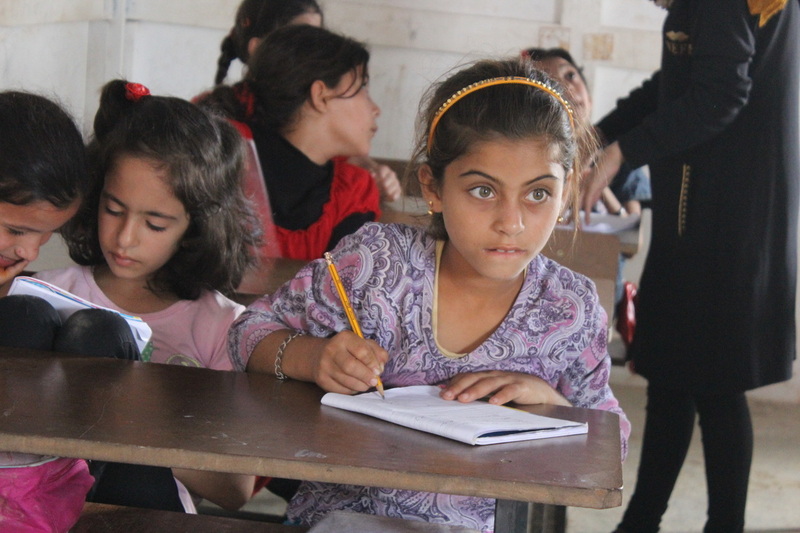 More than 300 young refugees are receiving regular education now. We are also providing them with psychosocial support and material aid where needed. With the help of more than 1,000 individual donors, we have achieved our initial fundraising objective for the establishment of a first Peace Centre at the Lebanese border to Syria. Thank you all for your trust and generosity! Your support also allowed us to realise our summer volunteer programme and to fill our Peace Centre with life. Profiting from the experience of the intensive foreign classes given over summer by our international volunteers, we have decided to extend our educational activities beyond our own Peace Centre and we are asking for your help for doing so. As from now, you can decide yourself where your money goes. Besides our Educational Programme Line, you can also fund our humanitarian aid activities.